Deposed President Mohamed Nasheed last night criticised the government’s attempts to introduce fees for free health insurance scheme Aasandha, saying the government had squandered funds marked for development on the police and military. Shortly after taking office, Waheed’s administration halted Public Private Partnership schemes and allowed extended resort leases to be paid in installments rather than upfront at the end of the lease. Nasheed’s Maldivian Democratic Party (MDP) said the move will immediately take US$135 million of the country’s coffers. “More than Rf 150 million (US$10 million) has been spent on police promotions. Another Rf 150 million (US$10 million) has been spent giving MNDF [Maldives National Defense Force] officers two years of allowances in a lump sum. Another Rf 50 million (US$3.3 million) has been spent repairing the damage to police headquarters. It was the police officers who staged the coup who vandalised the place and threw chairs and computers from the building’s windows. When this money has been wasted, we cannot accept it when they say there is no money for Aasandha,” Nasheed said. More than 1000 police officers were given promotions on March 31 – a third of the country’s police force – while police have revealed plans to recruit 200 new officers to the force this year. New Tourism Minister Ahmed Adheeb had previously called on Maldivian businesses not to pay Goods and Services Tax (GST) to Nasheed’s government. Nasheed said Waheed was obliged to implement the MDP’s manifesto, saying the coalition of parties that backed him to defeat Maumoon Abdul Gayoom in the country’s first multi-party elections in 2008 had agreed to carry forward the MDP’s manifesto. The coalition of parties that supported Nasheed in 2008 include Dr Waheed’s Gaumee Ithihaad (GI), the Dhivehi Qaumee Party (DQP) and Jumhoree Party (JP). The coalition dissolved months after Nasheed took office, and the three parties are now allied with Waheed. Nasheed’s address was his first since a 10 day trip to the United States of America last week. Speaking to US media, Nasheed alleged former president Maumoon Abdul Gayoom was behind his ousting, and insisted his life was under threat on February 7. Ahmed Nazim is the current Defense Minister, and acted as intermediary between mutinying police and military and Nasheed on February 7. “God willing, I will submit these details to the relevant courts and investigation. Such an investigation must have international oversight and has to be independent and impartial. They tried to kill me. They tried to take my life in order to stage a coup. 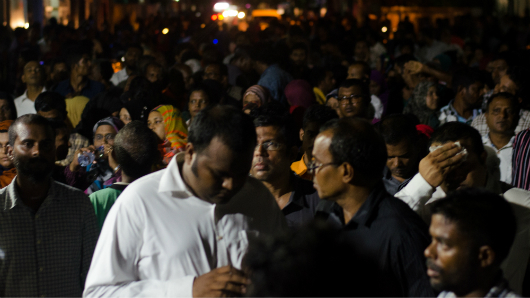 It is my duty to reveal what transpired on that day,” Nasheed said. “We have to clarify this atrocity, this coup, for the generations to come. I will submit what I know, the extent to which I knew and experienced it, to a trusted investigation,” he said. Following calls from the Commonwealth, European Union, India, America and UK for an independent investigation, Waheed instituted a three member Committee of National Inquiry (CNI) to look into the legitimacy and legality of the transfer of power. However, the CNI has come under fire from the MDP and local civil society groups for unilateralism and lack of independence. Further, the CNI has said it will not conduct a criminal investigation. Nasheed promised supporters he would ensure an investigation through international processes if domestic bodies failed to conduct an independent and impartial inquiry. Nasheed reiterated call for early presidential elections and highlighted the importance of an elected government. “You cannot sustain a government through force. The force behind any government is the people,” he said. Nasheed said soldiers had asked him to open the armory to put down the police mutiny, but he had refused to let them. “I came to power, and you voted for me, not to accumulate force. You wanted widespread transport networks, economic development, and to put an end to the drug plague and begging for healthcare, for. You voted for harbours, for sewerage systems, to build outer walls of football fields, to build roads, cemeteries and for holistic education,” Nasheed said, repeating the MDP’s election pledges in 2008. “What we didn’t do was accumulate force. What we didn’t do was torture people,” he added. 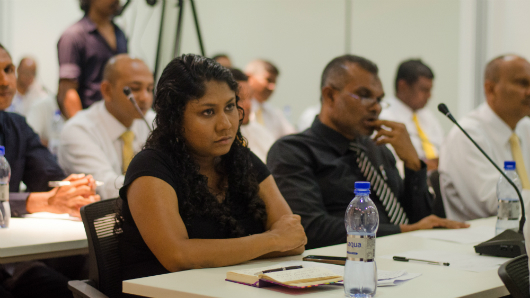 The MDP must sustain its protests in order to press for early elections, Nasheed said. He called on all of his supporters to stay at the protest camp, dubbed Insaafuge Maidhan (‘Justice Square’) and to continue to raise their voices. The establishment of the camp follows the government’s removal of the MDP’s protest camp near the tsunami monument by the police and military last month. “We will come out in large numbers for a massive protest. A long demonstration that will resolve our issues. A demonstration that will reveal to the world what Maldivians are fighting for,” he said. Nasheed said he was “disappointed” with America and India’s prompt acceptance of Waheed’s administration. The Commonwealth, EU and foreign governments have supported Nasheed’s call for early elections despite their engagement with Waheed’s administration.